The Con Artist by Fred Van Lente has been released by Quirk Books. The Con Artist was a fun and engaging read that manages to keep you on the edge of your seat until the very last page. The writer does a fantastic job of immersing the reader into this nerdy mystery. As someone who has attended hundreds of conventions, I think The Con Artist manages to perfectly capture the essence of the comic industry and the insane culture that pushes geeks everyone to insane levels. 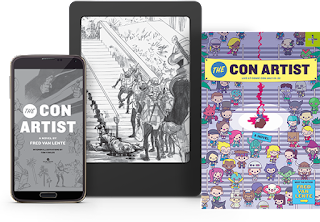 In the end, The Con Artist is a colorful, fast-paced novel that manages to bring out everyone's hidden geek by telling a compelling story full of mystery and action. To learn more, visit the official The Con Artist website.